Barren Mt. Castellone rises evenly from its base near the village of Cairo in the wide Rapido Valley. It is dominated by other heights, Mt. Corno and Mt. Cairo, yet it stood as the key commanding the bridgehead established by the Allies north of Cassino and centered in Cairo. Through Cairo, shelled with unceasing fury by the Germans, flowed practically all of our supplies, reinforcements, and the network of communications. The 1st Battalion, 142nd Infantry, had set out to take Mt. Castellone, when it was learned by radio that a battalion of the 135th Infantry had occupied it. Orders followed to relieve the 135th, which had climbed the height from the east and had met little or no resistance in doing so. During a period of waiting, from February 4 - 10, the 3rd Battalion, 142nd Infantry, joined the 1st Battalion in the defense of Castellone while further offensive measures were planned. Elements of the 143rd and 141st also were switched to this general defense. Enemy harassing fires were the chief threat to our positions. Time and again artillery crashed down into the valley and struck at the supply and CP installations in the Cairo vicinity. Four times in two days enemy aircraft darted in to drop their bombs. WINTER OBSTACLE. Lofty Mt. Cairo was white-hooded throughout the winter months and for the greater part of the spring. At the base lies the town of Cairo, hub of communications for our troops in the mountains. You are looking across "Purple Hearty Valley." Along Cairo's bordering ridges, 36th Division men sometimes reversed their parkas so that the white interior would blend with the snow. After dark each night supplies were brought up by mule train from a dump near San Michele. It required 75 mules to supply one battalion each day. In a blinding snowstorm on the morning of February 11, the 141st and 142nd Regiments attacked to the south to seize and hold Hill 468, a bowl-shaped plain on which stood another ancient abbey which the Germans had fortified. During the day fighting was intense but by nightfall friendly troops were reported within 50 yards of the abbey on 468. The weather throughout this operation was bitterly cold. For the night the attackers were ordered to dig in and hold their close-in positions, though one of the lead battalions reported its strength a total of only 100 officers and men. Next day the Germans took the initiative on nearby Castellone ridge, forestalling further attacks for the abbey. On February 12, beginning at 0400 and lasting until 0610, the enemy laid down an artillery concentration which exceeded any the Division had ever experienced. Nebelwerfer fire from the Germans' six-barrelled rocket mortar came over in volleys of sixes, one after the other. The barrage was directed over a large front and was followed by a strong German attempt to retake Mt. Castellone. The 143rd Infantry with attached troops defended the Castellone Hill mass: 1st Battalion, 142nd on Mt. 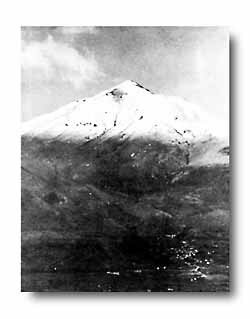 Castellone peak; 3rd Battalion, 143rd guarding Hill 706; 2nd Battalion, 141st defending the southern slopes of Hill 706 to Hill 465, and the 1st and 2nd Battalions, 143rd Infantry in reserve to the south. On Castellone, two battalions of the enemy worked up the slope under cover of the concentration, coming in amongst our positions at daylight when the artillery lifted. A critical five-hour battle ensued, as, with hand grenades, machine guns and rifles - some of which were discovered frozen in the morning cold - men of the 1st Battalion, 142nd, drove off the German bid. Had Mt. Castellone fallen, the entire Allied defensive line in the hills across the Rapido would have been seriously threatened. Late in the afternoon reorganization was completed. No ground had been lost. On February 13 a group of 15 German medics made request of a truce from 0900 to 1200 hours, February 14, in order to evacuate their dead. The request was approved and at the appointed time in the morning the Germans came forward. To keep them from walking into our positions our men carried down one hundred and forty-three German dead to the draw at the base of the hill. The Germans asked for a similar period the next day in order to complete the evacuation, which was taking longer than expected. The Commanding General, II Corps, refused this request but granted an extension of time to allow the truce to run until 1430. Action in this sector continued with little incident until the Division was finally relieved on February 26 by French units and elements of the 88th Division, then new to the line. These "forty days and forty nights" along the Rapido River and on the hills above Cassino had nearly halved the Division's combat strength. It was a tired 36th that was leaving the line going into a rest area near Piedmonte.